Adam Kremer picks up a win for the Versailles Tigers in Saturday win over the Eagles. 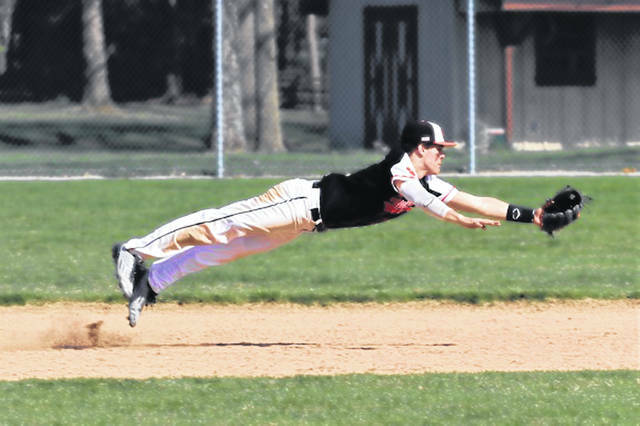 Versailles’ Andrew Demange dives for a liner at shortstop in win over Troy Christian. Brayden Robinson makes a backhanded catch at second for Versailles in win over Troy Christian. Matthew Niekamp pitches in relief for the Versailles Tigers to pick up a save in win over Troy Christian. Will Eversole picks up his first of four hits of the game for Versailles in win over Troy Christian. VERSAILLES – The Versailles Tigers defeated the Troy Christian Eagles 13-8 in a Saturday afternoon non-conference game on the Tigers home field. “It’s a good win,” Versailles coach Ryan Schlater said following the game. Troy jumped out to an early 3-0 lead before the Tigers would get their first plate appearance of the day. Versailles plated three runs in their half of the first with a Will Eversole two run single to center scoring Andrew Demange and Kyle Pothast. Brayden Robinson picked up the third RBI of the inning plating Zach Griesdorn on a groundout to third to knot the score at 3-3 after one inning of play. The Tigers added four runs in the third, a run in the fourth and four runs in the fifth to stretch their lead to 12-3 with Troy Christian coming to the plate in the top of the sixth. The Eagles added two runs in the top of the sixth while Versailles was adding a run in the bottom of the inning sending the game to the seventh inning with the Tigers holding a comfortable 13-5 lead. Troy plated three runs in the top of the seventh to close out scoring on the day and give Versailles a five run win. Eversole paced Versailles with four hits on the day with a single in the first, a doubled in the third and singles in the fourth and fifth innings. Griesdorn went 2-3 with 2-RBIs and 3-runs, Garrett Toops was 2-4 with 3-RBIs and a run and Nathan Wagner went 2-4 with a RBI and a Run. Robinson was 1-3 with 3-RBIs and a run scored, Demange went 1-4 with 2-RBIs and a run, Pothast was 1-4 with 2-runs, Ryan Martin 1-3 with a run and Conner VanSkyock was 1-4. Adam Kremer picked up the win in five innings of work on the mound allowing six hits and five runs while striking out four and walking two. Matthew Niekamp earned the save throwing two innings in relief giving up three runs and two walks. 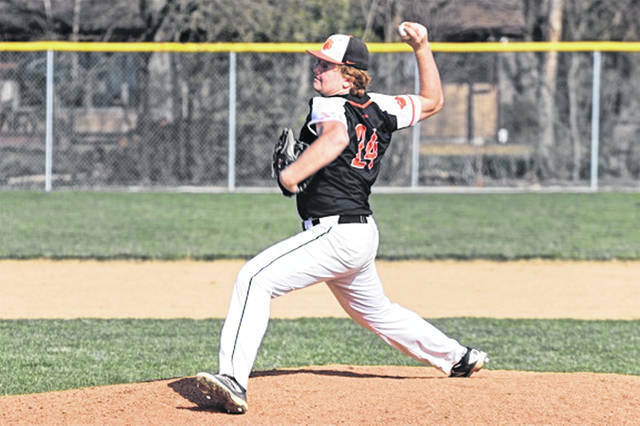 https://www.dailyadvocate.com/wp-content/uploads/sites/34/2019/04/web1_Adam-Kremer.jpgAdam Kremer picks up a win for the Versailles Tigers in Saturday win over the Eagles. https://www.dailyadvocate.com/wp-content/uploads/sites/34/2019/04/web1_Andrew-Demange.jpgVersailles’ Andrew Demange dives for a liner at shortstop in win over Troy Christian. 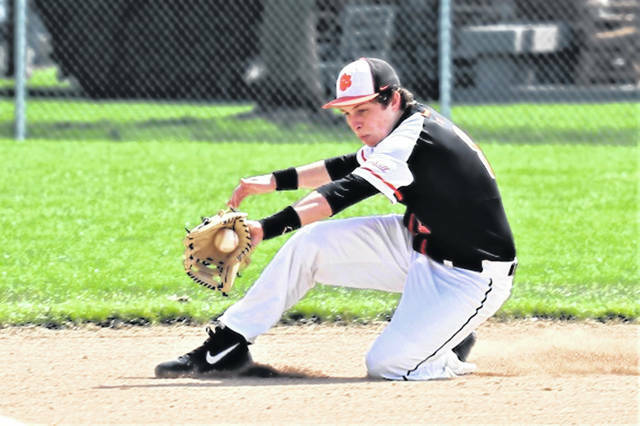 https://www.dailyadvocate.com/wp-content/uploads/sites/34/2019/04/web1_Brayden-Robinson.jpgBrayden Robinson makes a backhanded catch at second for Versailles in win over Troy Christian. 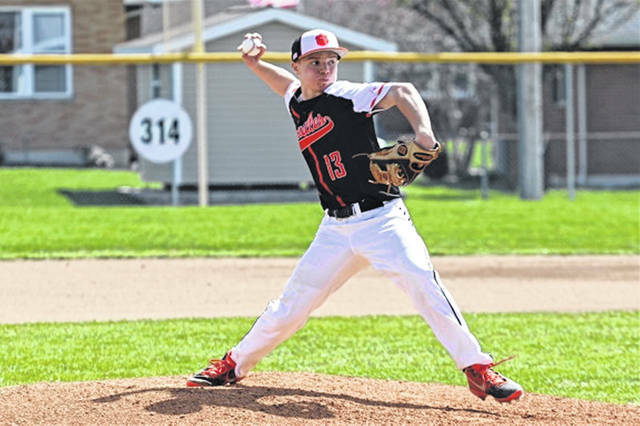 https://www.dailyadvocate.com/wp-content/uploads/sites/34/2019/04/web1_Matthew-Niekamp.jpgMatthew Niekamp pitches in relief for the Versailles Tigers to pick up a save in win over Troy Christian. 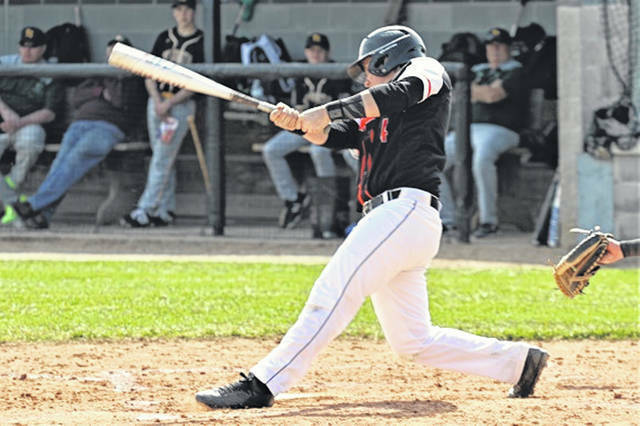 https://www.dailyadvocate.com/wp-content/uploads/sites/34/2019/04/web1_Will-Eversole.jpgWill Eversole picks up his first of four hits of the game for Versailles in win over Troy Christian.